Iodinated contrast media are commonly used in radiological techniques to highlight images of anatomical structures. Their use in recent years in invasive procedures, such as vascular catheterization, has undergone an exponential increase, resulting in very frequent use. In turn, adverse reactions have been described for these contrast media, ranging from simple skin reactions to anaphylaxis1. The incidence of these reactions has changed with the appearance of new iodinated contrast media, although there are still risks in terms of morbidity and mortality2. It is estimated that the incidence of adverse reactions for nonionic iodinated contrast media is 3%, with percentages of severe reactions to hyperosmolar media of 0.22% and 0.05%. Allergies to iodinated contrast media may manifest immediately, during the first hour of contrast medium administration, or after one hour of administration, with the latter being known as non-immediate. Skin reactions, in the form of a maculopapular rash, are the most frequently described form, followed by non-immediate urticaria with or without angioedema3. Other symptoms, such as vomiting, dyspnea, laryngeal edema, cardiac arrhythmias, or cardiovascular collapse, may also occur. Iodinated contrast-induced thrombocytopenia is a rare complication that has been described in only a few cases4, 5, 6, so its incidence is unknow as well as possible risk factors that develop it. Thrombocytopenia induced by iodinated contrast is an exceptional complication, and it is more frequent in relation to exposure to other drugs such as low-molecular-weight heparin. To establish a diagnosis, we used the George criteria, which can be used for any thrombocytopenia of drug origin (Figure 1). The first cases published in the literature referred to exposure to iodinated contrasts with high osmolarity, such as iopanoic acid, diopromide, sodium diatrizoate, sodium amidotrizoate, and meglumine7. With the iodinated hypoosmolar contrast media that are currently used, thrombocytopenia is less likely to occur due to reduced activation and platelet aggregation. In a molecular study comparing platelet activation and aggregation after exposure to iodinated contrast media with high osmolarity, low non-ionic osmolarity (iodixanol) and low ionic osmolarity (ioxaglate and iopamidol), the latter resulted in less platelet aggregation8. These results correlate with other in vitro studies of these three types of iodinated contrasts and their relationship with platelet degranulation measured by P-selectin expression, supporting the use of ionic hypoosmolar media, not only because of their lower risk of thrombocytopenia but also because they carry less thromboembolic risk due to the induction of less platelet degranulation9. The properties of ionized and nonionized contrast medium are shown in figure 2. Schulze et al. have shown that fibrinogen consumption and platelet aggregation with resultant thrombocytopenia can be induced in whole blood that is preincubated with high concentrations of iodinated contrast media and then exposed to platelet-rich plasma. However, the immunological mechanisms associated with the reactions produced by iodinated contrasts are not completely clear and in most cases remain unknown after diagnosis, given the few diagnostic tools available. Platelet aggregation may be the cause of thrombocytopenia secondary to unknown immunological mechanism. 1. The suspected drug precedes thrombocytopenia and by its suspension, it is completely resolved. 2. The drug has been the only administrator before the onset of thrombocytopenia or has been followed with other drugs by the suspension of the same with a normal platelet count. 3. Other etiologies of thrombocytopenia are excluded. 4. Re-exposure to the drug produces thrombocytopenia. Unlikely if none of the criteria is met. There are 3 hypotheses concerning the mechanism of production of contrast-induced thrombocytopenia: immunoallergic mechanisms after a previous exposure4, direct toxicity caused by the contrast medium5, and an idiosyncratic mechanism after a previous exposition10. The latter could have better positioning because most immunological exposure tests are negative, principally the basophil activation test (CD69 expression on CD4 + lymphocytes). The treatment of thrombocytopenia induced by iodinated contrasts depends mainly on the severity and symptoms suffered by the patient. In cases of severe thrombocytopenia, transfusion of platelets would be indicated to avoid the risk of intracranial hemorrhage. In the published cases, there have been no exact figure for the number of platelets upon which has been transfused platelets, being more determinant the presence of symptoms. In our experience, we had a patient who developed thrombocytopenia up to three times before reaching the diagnosis. He remained asymptomatic and had no serious bleeding events, although his platelet count after the last procedure with the highest amount of contrast was zero. This complication is severe, but conservative management can be used in combination with the avoidance of situations that could potentially provoke bleeding and transfusion of platelet concentrates may not be necessary11. Nonetheless, in most of the cases described to date, there has been a progressive increase of platelet levels over the 24 hours after the suspension of iodinated contrast. Perhaps, this may suggest that it does not have a direct toxicity on the bone marrow, because the bone marrow aspiration showed an adequate number of megakaryocytes, in some studies4. In some cases, corticosteroids have been administered. Although the efficacy of corticosteroids has not been established, they could play a role in accelerating platelet genesis. Treatment with intravenous immunoglobulins (IgGs) and plasmapheresis have an uncertain benefit because, as we have mentioned, the associated etiopathogenic mechanism is unknown. Therefore, apart from support measures, the most effective treatment consists of avoiding new exposures to the iodinated contrast medium. Within the field of vascular radiology and/or interventional cardiology, gadolinium is the best alternative to iodinated contrast media12. The first case published in the literature in which gadolinium was used was a patient undergoing cardiac catheterization for unstable angina who had developed hyperthyroidism induced by iodinated contrast13. However, the scarce radiopacity of the gadolinium medium limited the quality of the images and thus the diagnostic and therapeutic precision of the procedure. There are several gadolinium contrast media, which are marketed as Multihance (gadobenic acid), Primovist (gadoxetic acid), Gadovist (gadobutrol), Dotarem (gadoteric acid), Prohance (gadoteridol), and Omniscan (gadodiamide). The latter has recently been removed from the market in Spain due to the high incidence of brain deposits. The most severe limitation occurs in renal failure patients, for whom extreme caution is required, especially in patients with creatinine >3 mg/dl or if doses of gadolinium >0.4 mol/kg are used. The most serious complication, although rare, is systemic nephrogenic fibrosis, which consists of a fibrosing disorder that affects the skin and other organs such as the heart, joints, testicles and kidney. It has a higher incidence in patients with severe kidney disease or in hemodialysis, and its appearance may occur months or even years after exposure to gadolinium14. The gadolinium used most frequently during cardiac catheterization is gadoteridol15, which is used by our group in cases in which there is a contraindication to the use of contrast media. Their use is required to control the amount of administered gadolinium (never exceed 3 times the recommended dose 0.2 m mol/kg). How can coronary interventionism be guided? 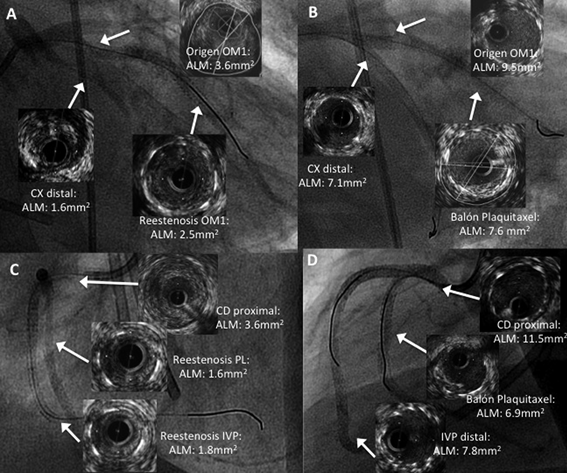 The minimal characterization of coronary lesions visualized with gadolinium contrast media highlights the need to use intracoronary diagnostic techniques to guide the procedure. The three techniques that can be used are intracoronary vascular ultrasound (IVUS), optical coherence tomography (OCT), and functional assessment through pressure guides (FFR and/or iFR). They are increasingly used in complex procedures with more prominence, especially in patients with allergies to iodinated contrasts16. However, there is no obvious experience in the literature to establish the association of these techniques with gadolinium media, especially in coronary intervention, so there is no consensus to establish a recommendation in this regard. Casey et al.17 have described the performance of angioplasty in a "haemodialysis loop graft" using gadolinium guided by IVUS, which is the only reference in the literature for this combination to guide angioplasty, a non-existent in the field of coronary angiography. Our group is using IVUS and gadolinium contrast in those cases in which iodinated contrast media are contraindicated. After performing the coronary angiography with IVUS, we assess the coronary segments for which the significance of the lesions is not well understood and quantify the true diameter of the vessel and length of the lesion (figure 3). We evaluate the characteristics of the plaque, foreseeing possible complications in case of complex anatomies such as very calcified or tortuous lesions. The use of IVUS delineates the strategy to follow during the steps of angioplasty, helping us to correctly choose the material and therefore minimize costs. IVUS assessment of the post-implant result offers a guarantee of good apposition and stent expansion, exceeding that determined by the simple angiographic evaluation. All these maneuvers with IVUS allow the use of less gadolinium during coronary angiography, which, as previously mentioned, is directly related to the risk of complications. OCT has a higher spatial resolution when compared to IVUS; however, the need to use contrast underscores a "handicap" because it would require higher doses. FFR would allow a functional assessment of the stenosis of coronary lesions, which is fundamental for those post-angiography; however, it will not provide advantages over the anatomical references obtained with IVUS. In summary, in the absence of experience in the form of literature in this field, the best alternative we have to guide a coronary intervention in patients with contraindications to iodinated contrasts is the gadolinium medium supported by IVUS. Morales-Cabeza C, Roa-Medellín D, Torrado I, et al. Immediate reactions to iodinated contrast media. Annals of Allergy, Asthma & Immunology.119 (6): 553-7. Gómez E, Ariza A, Blanca-López N, et al. Nonimmediate hypersensitivity reactions to iodinated contrast media. Current Opinion in Allergy and Clinical Immunology. 2013; 13 (4): 345-53. Torres MJ, Gomez F, Doña I, et al. Diagnostic evaluation of patients with nonimmediate cutaneous hypersensitivity reactions to iodinated contrast media. Allergy. 2012; 67 (7): 929-35. Shojania AM. Immune-mediated thrombocytopenia due to an iodinated contrast medium (diatrizoate). Canadian Medical Association Journal. 1985; 133 (2): 123. Chang JC, Lee D, Gross HM. Acute thrombocytopenia after iv administration of a radiographic contrast medium. American Journal of Roentgenology. 1989; 152 (5): 947-9. Wiemer M, Kreuzpaintner G, Lauer B, et al. Recurrent immune thrombocytopenia: a rare complication after contrast medium injection. Dtsch Med Wochenschr. 1995; 120: 1236–1240. Aster RH, Bougie DW. Drug-Induced Immune Thrombocytopenia. New England Journal of Medicine. 2007; 357 (6): 580-7. Hay KL, Bull BS. An Analysis of Platelet Activation and Aggregation Produced by Three Classes of Contrast Media. Journal of Vascular and Interventional Radiology. 1995; 6 (2): 211-7. Heptinstall S, White A, Edwards N, al. Differential effects of three radiographic contrast media on platelet aggregation and degranulation: implications for clinical practice? British Journal of Haematology. 1998; 103 (4): 1023-30. Bata P, Tarnoki AD, Tarnoki DL, et al. Acute Severe Thrombocytopenia Following Non-Ionic Low-Osmolarity Intravenous Contrast Medium Injection. Korean J Radiol. 2012; 13 (4): 505-9. Cubero Gomez JM, Guerrero Marquez FJ, Diaz de la Llera L, et al. Severe thrombocytopenia induced by iodinated contrast after coronary angiography: the use of gadolinium contrast and intravascular ultrasound as an alternative to guide percutaneous coronary intervention. Rev Port Cardiol. 2017; 36 (1): 61.e1-61.e4. Parodi JC, Ferreira LM. Gadolinium-Based Contrast: An Alternative Contrast Agent for Endovascular Interventions. Annals of Vascular Surgery. 2000; 14 (5): 480-3. Matuszczyk A, Hahn S, Böse D, Eggebrecht H, Schmermund A, Quadbeck B, et al. Gadolinium as an Alternative Contrast Agent During Cardiac Catheterization in Patient with Iodine-induced Hyperthyroidism. Exp Clin Endocrinol Diabetes. 2006; 114 (06): 336-8. Amet S, Launay-Vacher V, Clément O, Frances C, Tricotel A, Stengel B, et al. Incidence of Nephrogenic Systemic Fibrosis in Patients Undergoing Dialysis After Contrast-Enhanced Magnetic Resonance Imaging With Gadolinium-Based Contrast Agents: The Prospective Fibrose Nephrogénique Systémique Study. Investigative Radiology. 2014; 49 (2): 109-15. Sambol EB, Van der Meer JG, Graham A, Goldstein LJ, Karwowski John K, Dayal R, et al. The Use of Gadolinium for Arterial Interventions. Annals of Vascular Surgery. 2011; 25 (3): 366-76. Muneuchi J, Okada S, Nagatomo Y, Iida C, Matsuoka R, Shirozu M, et al. Intravascular Ultrasound-Guided Cardiac Intervention in a Fontan Patient with Allergy to Contrast Media. Texas Heart Institute Journal. 2017; 44 (5): 373-5. Casey PE, Miranda CJ, Al -Khaffaf H, Woodhead PM. Intravascular Ultrasound-Guided Angioplasty of Hemodialysis Loop Graft in a Patient with Contrast Allergy. The Journal of Vascular Access. 2014; 15 (5): 424-6. Copyright: ©2018 Guerrero-Márquez FJ. This article is distributed under the terms of the Creative Commons Attribution 4.0 International License.